Watching that 2001 promotional video was extremely poignant because it was yet another reminder of all the expectations we no longer have. In the 1960s, hundreds of thousands of people were employed- mostly in the state of California- in and around the space program. These were very good paying jobs that raised families in middle class comfort, creating a new gold rush to a new California dream. Today, California leads America into a new feudal nightmare, a bifurcated garrison state in which a small cognitive elite sit atop a vast ocean of poverty. It's become so segregated by class that most upper class Californians have no idea their state is the poorest in the nation. It all began to fall apart in the early 1970s, as the Apollo program ended and NASA's sights were set ever lower. Thousands of jobs were lost, beginning a middle class exodus from California that continues to this day. Apollo skeptics have gleefully pointed out the fact that every mission since the moon landings were low earth orbit shuttle missions, the proverbial walk around the block in outer space terms. But the incredible cost (and danger) of space in relation to benefit- and the bludgeoning recession and oil shocks of the 1970s- made the numbing yet practical (someone has to maintain all those spy satellites) shuttle program a gimme for Congress. Now Internet billionaire Elon Musk is trying to rekindle the old rocket flames. His SpaceX startup has been making a fool of NASA and has become the hottest name in rocket technology. Others are following his lead, most notably Amazon honcho Jeff Bezos. Musk realizes that you have to do something with all that hardware so he proposes a Mars mission with all the Red Bull-fueled gumption of a Silicon Valley startup. "I'm hopeful that the first people could be taken to Mars in 10 to 12 years, I think it's certainly possible for that to occur," he said. "But the thing that matters long term is to have a self-sustaining city on Mars, to make life multiplanetary." He acknowledged that the company's plans were too long-term to attract many hedge fund managers, which makes it hard for SpaceX to go public anytime soon. But there's a force not even a Valley whizkid can resist and that's the power of entropy. We are so used to rapid-fire technological and scientific progress, we're not going to know what to do now that the rate of progress is beginning to slow. Some believe we've picked all the low-hanging fruit, that all the big, flashy breakthroughs have been made and now humanity is like late-period REM or U2, continuing to record and tour long after the blockbusters have come and gone, watching the audience age, watching the returns diminish. I recently read Jacques Vallee's memoirs of his time during the heady days of Silicon Valley and it was shocking to me how much of the great gizmos we see as novelties were all in prototype long before most of you were born. What is touted as the apple of the American economy these days? Well, there's Facebook, which is nothing more than a souped-up America Online, which itself was just a fancier version of the dial-up BBS systems in use since the 60s. We've all seen the videos from the 60s, showing off the prototypes of the Internet as we know it today. 40 years ago Silicon Valley was putting the basic architecture into place. What are they doing out there today? Besides creating hedge fund pirateware and Facebook games, I mean? 2015 looks nothing like I imagined it would when I was a kid. But we didn't realize that gravity, entropy--and rapacity-- would all get such a megaphone in the debate. Another Internet whiz kid, Peter Thiel, has diagnosed the problem- we have had great success in the world of electrons, not so much in the world of atoms. "We live in a financial and capitalist age, not a scientific or technological age," investor Peter Thiel said at the Gartner Symposium in Orlando yesterday, echoing themes he has been talking about for several years now. 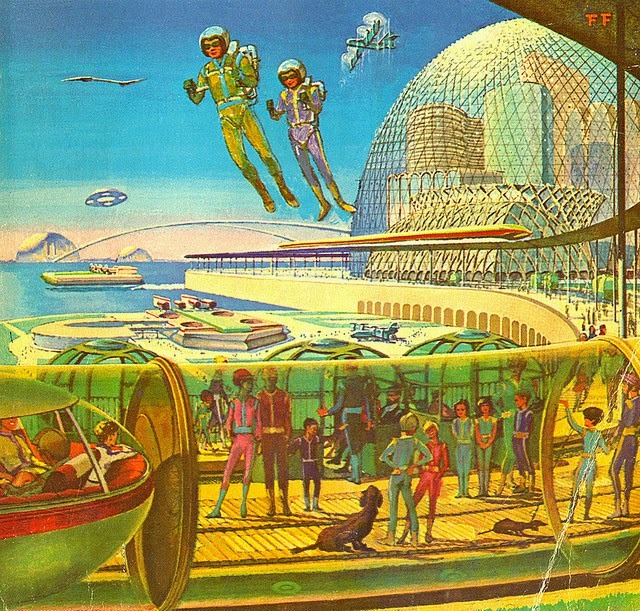 In the 50s and 60s, science and technology meant not only computers, but also space, underwater cities, energy, nuclear power, etc. Now, he said, when we talk about technology, we pretty much just mean computer technology. He doesn't question that we're doing great things in the Internet and in mobile, and that's enough to dramatically improve business efficiency. But he reiterated the subtitle manifesto of his Founder's Fund: "We wanted flying cars, instead we got 140 characters." That's not meant as a critique of Twitter as a company, but "it's not clear it's enough to bring our civilization to the next level," he said. This speaks to a theme I've been banging on all along. Just because something exists on paper, doesn't mean it exists off of it. Science fiction films conditioned us to expect a lot of great things that required expenditures of resources that simply made them untenable. Star Trek can't exist without energy and lightspeed travel that goes way beyond most physicist's wildest speculations. And then there is the inconvenient fact that after a long period of technological stasis (the 17th Century AD isn't all that technology dissimilar to the 17th Century BC), we had a burst of creativity, but now the default setting of 'painfully slow, incremental progress' seems to be reasserting itself. Air travel is nearly identical today as it was in the 1960s- in fact many 1960s airframes are still in use. Some cars drive themselves, some use electricity, but they don't fly. Hovercraft are not consumer products. Pops doesn't take the minicopter to work every day. There are some very interesting bullet and maglev trains out there, but that's old technology and most commuter trains still use diesel or electric engines. Some of the futuristic technology that does make it to market fails simply because it offers an awkward consumer experience- Google Glass has been discontinued, for instance. Others- such as virtual reality- require such labor-intensive market prep that they become financially untenable. You may have noticed you don't hear much about Transhumanism lately. Again, another case of concept failing when it came to the application stage. The Singularity may well come, but unless major breakthroughs are made, breakthroughs that require sums of money there's no evidence are being spent, it will come and go without us. Who really wants to go first when you think about, being carved up like a turkey in hopes of some promised digital immortality? For the foreseeable future, we'll still be fragile bags of meat, subject to the same limitations- and not a few new ones- that our ancestors were. This probably helps to account for the continuing popularity of the superhero mythos, as well as the popularity of genres like urban fantasy, while science fiction itself recedes to a small and increasingly fractious priesthood. Hell, even the growing popularity of Gnosticism is a byproduct of the Atom's dictatorial rule. I mean, they called it first, didn't they? 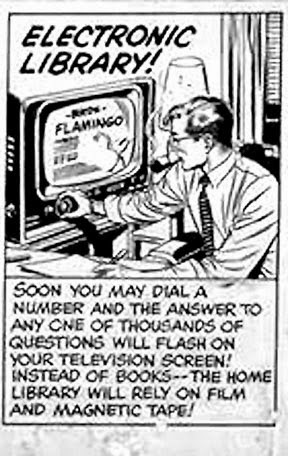 How to deal with the tyranny of the Atom is going to be a major conundrum. It's going to take the best minds of the future to overcome, and it probably won't be an elective debate. I think circumstances will force us to confront these issues once and for all. We haven't changed our basic, workaday technology- not really- because it's been easier not to. That most likely will not be an option in the near future. UPDATE: Well, we're getting Pluto. After a fashion.